It’s raining and thundering outside today. A good thing. We need the rain. And rain means puddles and water in the river. But thunder means we have to stay inside and take care of my buddy Cisco who does not appreciate these natural phenomenons. So instead of finding mud puddles, we’re reading books. Which is an ok activity too! 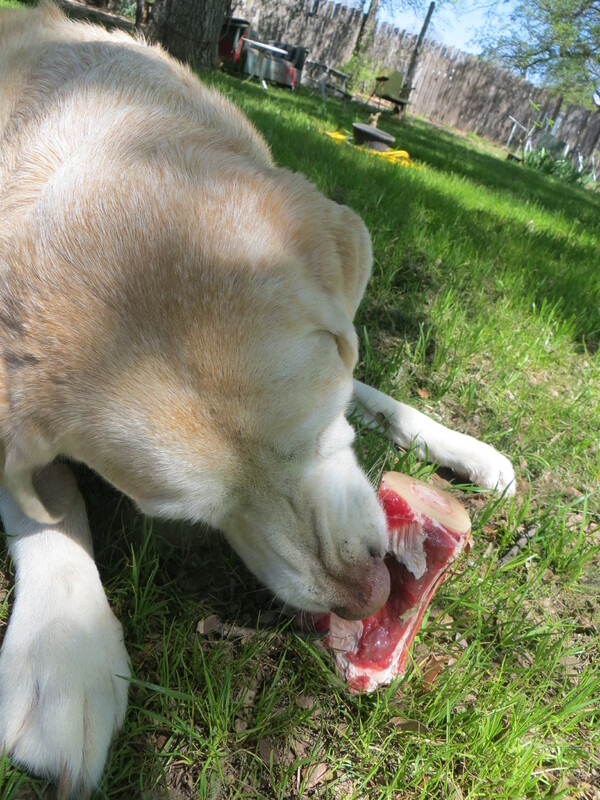 Yesterday the Mom Person went to the butcher shop and got us some really nice big bones to chew on. She loves us truly! We enjoyed them for quite some time but were not allowed to bring them in the house to sleep with. They had to stay out in the front yard. Well! This morning when we went out, there was a big ole vulture chewing on our bones! Right there in our yard! He flew away but the Mom Person got a picture of him in the tree. But now our bones smell funny and I don’t feel like eating them today. Walker didn’t seem to mind though. I tell you all of this because, as you know, the other day, I received a package with some books and my very own cuddly vulture. 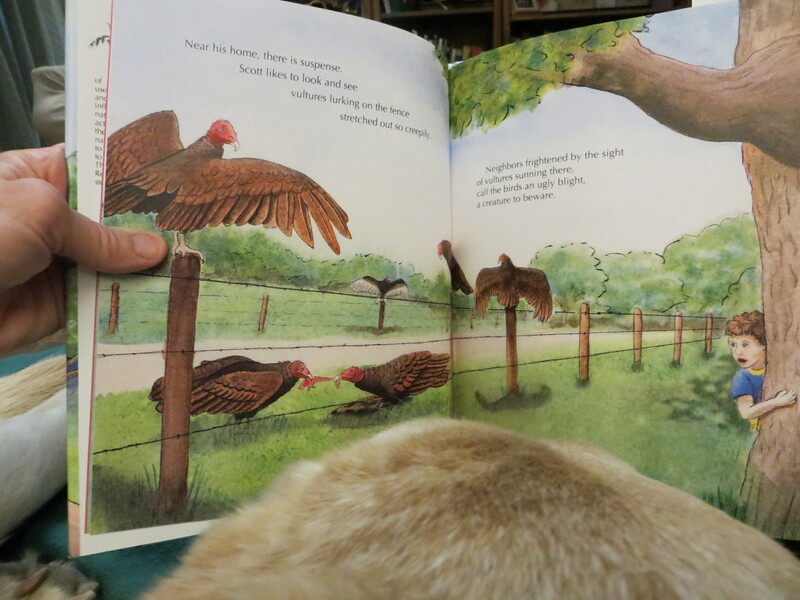 The Mom Person thought that since we had a vulture in the yard, it was a sign that we needed to sit down and read that book about turkey vultures! 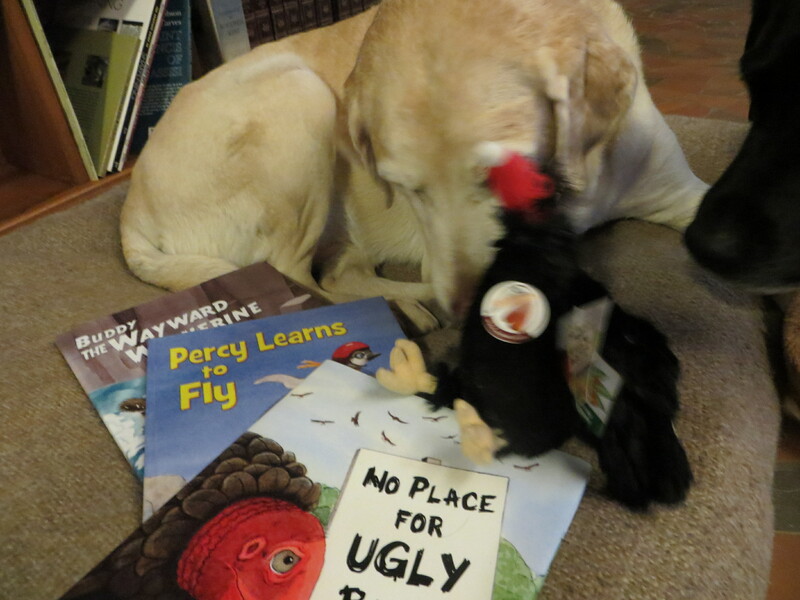 No Place for Ugly Birds was written and illustrated by Mary Livingston and published by Red Tail Publishing in 2013. It does a great job of making you appreciate those “ugly” birds! 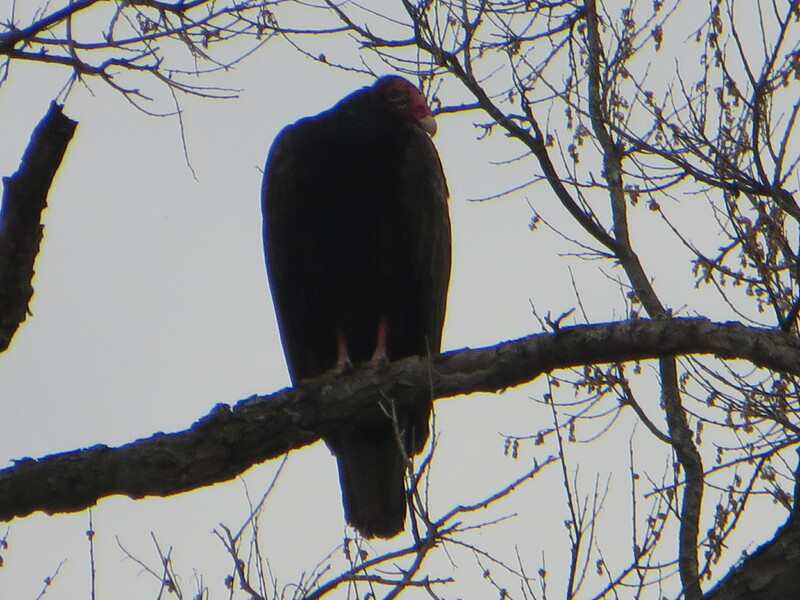 You see, turkey vultures are scavengers. Which means that they eat dead stuff. Like roadkill and animals that just die out in the woods or fields or rivers. And I guess that includes bones that dogs leave lying about the yard. But it seems that they wouldn’t attack me when I’m just walking about or romping in the yard. Just if I were to die while doing those things and the Mom Person didn’t realize and didn’t know to bury me before the vultures found me. That would make the Mom Person very sad, I think. Did you know that vultures will vomit on you if you bother them?! Pretty cool! Anyway, the book is very informative and a fun read besides. It is written in rhyming verse with some good rhythm. I love rhymes and rhythm! The illustrations are really nice. The vultures look more sad than ugly. In the story, some town people don’t like the vultures hanging around and chase them away. The main character, Scotty, is very sad. But when dead salmon start piling up and stinking really bad, everyone agrees that the vultures have their place and need to return to clean the place up! In the back of the book there is a page of vulture facts that is very fascinating. And a list of resources for finding out more about turkey vultures. You should really check this book out! And now I give you the Muppets singing The Ugly Song! 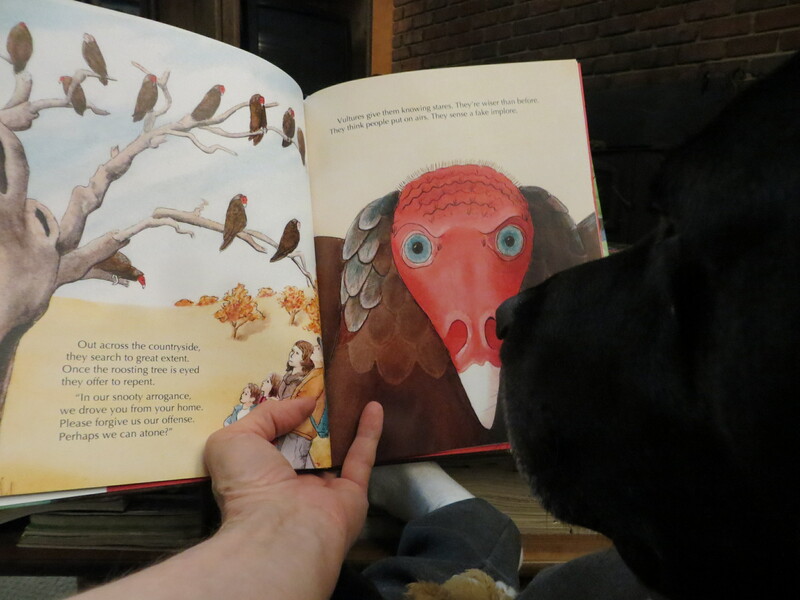 This entry was posted in children's books, cooperation, reading dogs, teamwork and tagged Mary Livingston, No Place for Ugly Birds, scavengers, the Muppets, the Ugly Song, Turkey vultures by readingwithrhythm. Bookmark the permalink. I once wrote a poem about Turkey vultures, they are ugly aren’t they? Fun type of ugly though. I’d like to see your poem! I’ll bet it’s a funny one! I used to think vultures were kind of spooky. They have a way of swooping down so quietly. But I’m better about them now that I’ve read Ms Livingston’s book. Now they just seem kind of funny. Both in need of a bath. And frequently stopped and tinkled. The turkey in socks is called Froob. The one with the pom pom is Bean. Now that would make for a good picture book! Thanks for sharing that with me! It goes perfectly with the book! I’m thinking picture book. I can see those birds strutting down the street full of mischief! Yay! I was struggling for an April pb idea anyway, thanks! yes! those Muppets are a little crazy fun! what a coincidence you had a vulture in your backyard, and received a book that had to do with vultures. Your momma must love you guys so much to go to the butcher’s especially to get you some delicious bones….. they must be as even the vulture liked them! That book looks reallycute, and I tell ya good thing I don’t have a kid of my own or I’d be filled to the brim with all these wonderful books your review! We get vultures soaring around here a lot. And I find them kind of spooky. That’s why I got the book. And now I understand them a little better. But I’ve never had one try to steal my bone before! That’s just rude! I’m glad you like the books that I find. Even if there are no kids at your house, you might find you’d like some to read for yourself. Picture books are pretty awesome!